WE WILL TRY OUR BEST TO SOLVE THE PROBLEM FOR YOU! It gives you two ways to import photos and videos.One is ti use USB cable ,the other is to read form SD/Micro SD card directly. The Connection Kit supports standard photo formats,such as JPEG and RAW etc. SAVE UP TO 10% OFF, Top Rated USA , BEWARE of Fakes !! 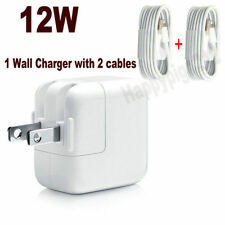 Power = 12W. Cable,for iPhone 5/5C/SE/6/6S/6 6S Plus/7/7 Plus,iPad mini,iPad Air etc. Usually it takes 2-7 weeks. 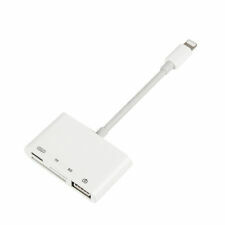 With the USB OTG cable adapter, you can transfer photos and videos to your new iPhone 5, 6 & 7 with OTG capability. 8-Pin OTG to USB Adapter Cable for the iPad Air, New iPad & iPad Mini. Product Interface:USB A female to Lightning 8PIN. 1x SD card reader. Supporting SD card capacity no more than 64 GB(SONY sd card is NOT compatible) on JPEG/RAW/H.264/ MPEG-4 formats under folder:DCIM. DO NOT support Wi-Fi SD card. DO NOT support SONY high speed SD card. Provides an alternative connection via a female to female connector for the Apple Pencil and 8-Pin cable. Charging Adapter for Apple Pencil and iPad Pro. Enables a more convenient charging experience when using your Apple Pencil and iPad Pro. 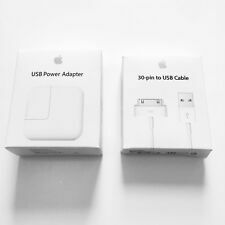 Product: Apple Lightning Cable 10W Charging Block (A1357). Authentic Apple product. Compatibility : iPhone, iPad. Condition : Excellent gently-owned working condition. Interface: For Lightning / SD card / TF card / USB 2.0. Micro SD / TF Card Port You can insert TF Card to this adapter,then Once you plug in this adapter, your Phone / Pad will automatically. You can insert SD Card to this adapter,then Once you plug in this adapter, your Phone / Pad will automatically. Iphone 7 7Plus, iPhone 6s Plus, iPhone 6s, Phone SE, iPhone 5s, iPhone 5C, iPhone 5. 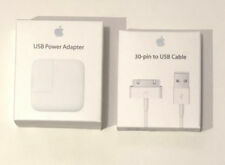 1 x Lightning to USB Adapter. Plug Type: Lightning Plug USB Plug. You can connect the it to the mouse/ computer keyboard.